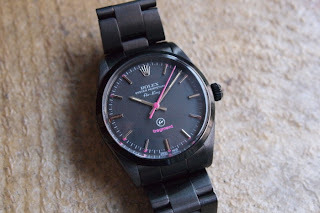 Hiroshi Fujiwara of Fragment Design has produce a custom Rolex Perpetual Air King. The watch features a gun metal colour case and strap. The watch dial will have pink accents and the Fragment Design logo. Evidently these watches are gifts to the employees of the firm. There is not much information on this watch, so I will update this if there is more information.